Facial injuries are in motor vehicle collisions are difficult to value because they rarely stand alone. Normally, if the accident was so serious as to cause damage to the victim's face, there are other significant injuries, too. Dog bite cases often give a little bit clearer picture because it is more likely to be an isolated injury. There was data published a few years back that the median settlement and verdict in facial scare cases is $20,000 in Maryland and $32,000 in Virginia. I think this statistic is pretty much useless, and I certainly don't put any stock in it. I can tell you the case our firm has handles would have a much higher average. Here are some sample cases to look at and compare to your case. Keep in mind these cases were selected very much at random, and you can't necessarily glean much from them. Still, I think they are helpful and help people better understand what these cases are worth. 2018, Connecticut: $364,000 Arbitration Award. The plaintiff is at her friend's house when she is bit on her face by the owner's 35 pound Portuguese Water Dog. She receives stitches and plastic surgery and other treatment for the scar. An arbitrator awarded for $364,094. The award is comprised of $14,094 in past economic damages (there are rarely high medical bills in dog bite cases) and $350,000 in pain and suffering damages. $150,000 in past non-economic damages and $200,000 in future non-economic damages. National Grange provided homeowner's insurance to the dog owner and paid the arbitrator's award. 2016, Oregon: $576,457 Verdict. A 29-year-old male’s job duties include filling a tanker truck with CO2 from a high-pressure tank. He connects all of the equipment to his truck. He turns on the CO2 valve and the steel hose. The metal adapter attached to the tank shoots up and hits him in the face. He sustains a fractured jaw that requires reconstructive surgery, fractured teeth, chest bruising, and a large visible scar with nerve damage in his jaw. He claims that the hose and adapter struck him while defendant’s claim it was a dust cap. Plaintiff brings a lawsuit alleging the driver did not properly reconnect the hose. A jury awarded the man $76,457 in economic damages and $500,000 in non-economic damages. 2015, Michigan: $200,000 Settlement. A woman in her 40’s is a passenger on a pontoon boat taking a relaxing late-night ride. During the ride, all lights are properly lit, and the boat is moving at a slow pace. Suddenly, the plaintiff looks back after hearing a loud engine and sees another boat speeding toward the same small section of the lake. It crashes into the boat the plaintiff is riding on, causing it to capsize. Plaintiff is thrown into the water, as are the other people on her boat. She becomes trapped under the surface momentarily. She suffers head and neck trauma, a facial laceration, and fright as a result. The facial laceration over her left eye leaves a one and a half inch permanent scar. She sues the drivers of the other boat for negligence and piloting the boat while intoxicated. The parties settled for $200,000, the remainder of defendant’s policy limits after the owner of the boat also sued defendants and settled for $100,000. 2015, California: $105,000 Verdict. A twenty-two-year-old woman is at her boyfriend/defendant’s home. She is sitting on the ground with his pet pit bull and practicing tricks when it bites her forearms and the right side of her face. The woman sues her boyfriend. He argues that they had been together for years and that the woman was familiar with the dog and that she teased the dog causing the attack. She is hospitalized for three days and has reconstructive surgery to her right eye socket. As a result, she is left with a two-centimeter scar near her right eye. A jury finds that the man was solely responsible for the attack, and awards the woman $105,000. 2015, New York: $95,000 Settlement. A six-year-old girl is crossing the street on her scooter when she is struck by defendant’s vehicle. As a result, she sustains facial fractures to her right frontal bone, cranial fossa, right orbital bone, and right maxillary sinus, leaving her with facial scars. She files a claim against the defendant, alleging he failed to yield the right of way and that he was operating the vehicle at an excessive speed. Defendant denied the allegations, but the parties settled for $95,000. 2015, New York: $75,000 Settlement. A ten-year-old boy is a passenger in a vehicle when the defendant crashes into the vehicle. The boy sustains a laceration to his face and residual facial scars in addition to strains and contusions due to the impact. He alleges that the defendants were negligent. Defendants disputed the damages, but the parties settled for $75,000. 2015, New Jersey: $41,500 Verdict. A 20-year-old girl is in defendant restaurant when she approaches the bar and is struck in the face with a wine glass by the defendant. Defendant was in an unrelated dispute with another restaurant guest. Defendant immediately leaves and is subsequently pleaded guilty to assault. The woman also sues the owner of the restaurant for the failure to provide adequate security. After the incident, the girl is taken to the hospital. She is left with a permanent facial scar even after undergoing cosmetic surgery. A jury finds that the defendants are responsible for her injury, and she is awarded $41,500. 2015, New Jersey: $41,000 Settlement. A fifteen-year-old girl is bitten in the face by a Rottweiler mix dog while visiting her grandmother’s house, and she sustains facial lacerations as a result. Her plastic surgeon states that she will need corrective surgery. She sues her grandmother and the owners of the dog, claiming that the owners were told to put the dog away while she was in the house. Defendants claim that she was familiar with the dog. During arbitration, the case settled for $41,000. 2014, South Carolina: $93,000 Verdict. An 11-year-old boy was the back seat passenger of a vehicle that was struck and overturned. The vehicle, totally destroyed in the accident, showered the youngster with glass. Despite immediate treatment and surgery, the boy suffered permanent scarring to his face, arms, and legs that will require future treatment for scar revision. Plaintiff’s family filed suit claiming $20,854.77 in past medicals and an approximate $10,150 in future costs for scar revision treatment. The defense admitted liability. A South Carolina jury awarded the boy $93,000 in damages. 2013, Pennsylvania: $15,000 Verdict. A 10-year-old girl is injured when the vehicle she is riding in strikes a State Farm insured vehicle that made a left-hand turn in front of them. She sustains a concussion and facial laceration as the result of the accident. While the concussion prevents her from participating in karate lessons for approximately six months, the facial scar is the crux of the case. The stitches that she received in her bottom lip create a lesion-type scar on the right side of her lower lip, with a linear scar continuing diagonally outward from the center of her chin. Nineteen when the case goes trial, she claims that the facial scar affected her a great deal over the years. She claims it looked like a bad cold sore at times, and classmates often made fun of her. She claims that when she met people, they would stare at her scar, making her self-conscious. Though she underwent scar revision surgery six years after the accident, she always intended to pursue career opportunities in modeling and now cannot due to the scar. The defense, who stipulated to liability, cross-examined the Plaintiff as to the fact that she apparently remained popular in school, before and after the surgery. A jury awards $15,000. 2012, Virginia: $300,000 Settlement: Plaintiff is operating a small car. As he proceeds through a green light, he is struck by a large cargo van. Amongst other injuries, Plaintiff suffers closed head trauma resulting in a concussion, facial lacerations requiring sutures, and a hematoma under the scalp. Plaintiff additionally suffers a closed fracture of the upper humerus, resulting in a 15% impairment rating. 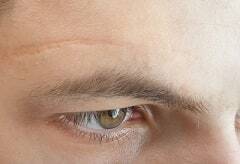 Plaintiff’s facial lacerations require cosmetic surgery due to a misalignment of the eyebrows. Plaintiff claims $56,717 in past medical expenses, $5,965 in lost wages and $17,850 for future medical/cosmetic treatment. The defendants, the van driver, and the driver’s employer admit liability and agree to a $300,000 settlement. 2011, Florida: $1,050,000 Verdict. Plaintiff, a 32-year-old realtor, sustains facial lacerations when he is struck in the face with a glass during a fight while at a night club. He sustains six facial lacerations, leaving 10 inches of permanent scarring. He files suit against the club for negligent security, contending that the attack was foreseeable as there have been prior fights and attacks. He claims facial nerve damage and difficulty with raising his eyebrows and the corner of his mouth, and that his features are not slightly irregular on one side of his face. He claims a strange taste in his mouth though he can eat and speak normally. Defense counsel contends that the proper security measures were in place and that the incident boiled over in a matter of seconds and could not have been prevented. The jury awards $150,000 in lost wages, $100,000 in past and future medical bills, and $800,000 in past and future pain and suffering. 2011, California: $1,234,952 Verdict. A 44-year-old unemployed woman’s pickup truck flips when she is struck by a police vehicle responding to an emergency call. The police officer, exceeding speeds of 100 mph, merges onto a left shoulder to avoid a motorcycle that moves into his lane. When the officer attempts to steer back into the lane, he loses control, skids across the highway, and strikes the Plaintiff’s truck. The truck flips onto a guardrail, bounces off, and skids on its roof for approximately 100 feet. Plaintiff sustains multiple lacerations to her face, as well as a partially severed ear. She is hospitalized for two days and undergoes a total of four procedures to repair and reconstruct her ear and facial lacerations. She additionally has glass removed from her face and scalp. A reconstruction expert determines that the motorcyclist would have been unable to see the approaching police vehicle due to the officer’s speed. The defense does not dispute the extent of the Plaintiff’s physical injuries or reasonableness of her medical treatment. Instead, defendant's counsel argues that the officer was properly responding to an emergency call and that the accident would not have occurred if not for the unsafe and illegal maneuver by the motorcyclist. The jury awards the Plaintiff $34,952 in economic damages and $1,200,000 in non-economic damages. 2011, Ohio: $12,315 Verdict. Plaintiff, 18, is traveling as a passenger in her then boyfriend's car, a State Farm insured vehicle. The street is covered in ice, and the defendant loses control of his vehicle and strikes a tree. The plaintiff suffers a facial laceration that requires emergency treatment. Plaintiff receives over 20 stitches to repair her facial injury. The plaintiff alleges the defendant was negligent in failing to maintain control of the vehicle, and because of this is she is receiving stares at her job at a pet store due to its unsightly appearance. The defendant, the driver of the vehicle, admits liability for the accident but contends the scar is not as visible as the plaintiff alleges. The jury finds for the plaintiff but awards only $12,315 in damages. 2010, Pennsylvania: $5,000 Verdict. A 10-year-old girl sustains abrasions, contusions, and a facial scar when a pickup truck crosses the center lane and strikes the school van that she was riding in, head on. Plaintiff sues the school van owner, who is later dismissed from the case, as well as the pickup truck driver. A jury awards the Plaintiff $5,000. Permanency: If the scar can be removed with ease by a plastic surgeon, that is going to decrease the value. Conversely, a permanent scar is going to have much greater value. Gender: Juries are sometimes sexist. Whether this is right or wrong is not the issue. It is. So it impacts the value of the case. Women get more money in scar cases than men do. Marital Status: Again unfair. But juries are going to give more money to someone who has not yet found a spouse. Location: The more visible the scar, the greater the value of the claim will be to the insurance company and the jury. If you have facial scars and other injuries, you need the best possible lawyer to help you get what you deserve. As you can see, the value of facial scar injury cases vary wildly, and one of the reason is the quality of the victim's legal counsel. We have handled many of these cases, and we know how to fight to get as much money as we possibly can in these cases. Call our Baltimore-based law firm at 800-553-8082 or get a free claim evaluation online.